East-Asian dragons are almost invariably portrayed with a red sphere in their mouths, in front of their mouths, or-- as in Javanese art--on top of their heads. In the famous lantern procession celebrated by Chinese people on the 15th of the first month, the red sphere precedes the dragon. This sphere is called huoh chuh, "fire pearl". 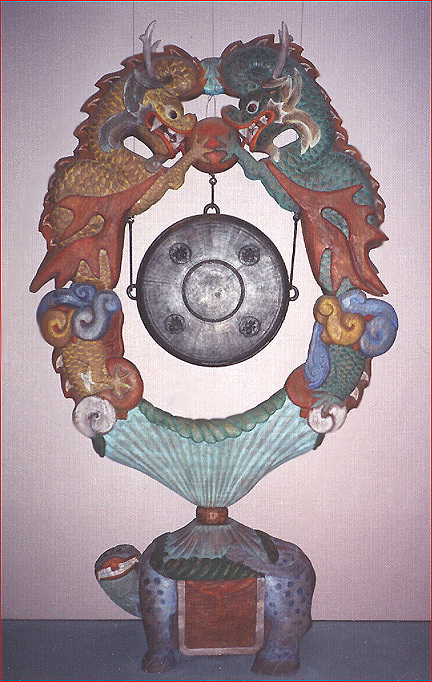 Shown here is a Buddhist gong-hanger produced in 18th- or 19th-century Korea. The flames that erupt from the pearl in some representations parallel the flames exhaled by dragons in other traditions. But what does the red sphere signify? And where does the image of the dragon itself come from? Scholars agree that the pearl is celestial. But does it signify the moon, as some have suggested? Or is it the Sun, as others have claimed? The spiral inscribed upon the pearl remains an enigma. Some specialists emphasize the pearl’s connection with thunder. 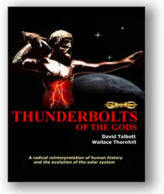 An ancient Chinese charm declares that "a spiral denotes the rolling of thunder from which issues a flash of lightning." Could this apply to the spiral imagery attached to the dragon ball? The comparative symbolist, G Elliot Smith, believed so: The dragon's red ball with engraved spiral, "which was believed to have fallen from the sky, was homologized with the thunderbolt”. A Korean piece of art in Deoksugung Palace, Seoul, depicts the red pearl between the two dragons in the traditional shape of the Indian vajra or lightning image. The lightning theory would interpret the pearl as a Chinese variation on the universal motif of the thunderstone. The common belief held that thunderstones fall from the sky during thunderstorms or battles of the gods. Thus huoh chuh, the Chinese designation of the pearl, also means 'meteorite'. A widespread superstition warns that when the blue dragon and the yellow dragon battle in heaven, fire balls and pearls fall to the ground. Some gemstones, known as "dragon's eggs", were believed to cause thunderstorms: When the egg hatched, a young dragon would ascend to the sky amid thunder, lightning, rain, and darkness. A large body of folklore delineates the connection of the dragon with a stone, egg, or ball that produces lightning. Any explanation for the Chinese dragon pearl must apply to similar traditions found across the globe. The Vedic dragon Vritra concealed the sun. The "Worm" encountered by Arthur's knight Peredur had a stone in its tail that had the ability to turn everything into gold. Uncegila, a serpent in the mythology of the Brulé Sioux, had an ice-cold heart "made of flashing red crystal". The Caribs of Dominica believed in a serpent with a sparkling stone on its head, described as an eye. And scores of other dragons around the world swallowed, enclosed, or carried similar spherical objects, alternately identified as the sun, an egg, an eye, the heart or soul of the serpent, or a precious stone. The catastrophist model interprets the serpent and the sphere as a vagrant luminous object in the sky accompanied by glowing plasma effects. One might interpret the serpent and the ball as the tail and nucleus of a comet. But modern-day comets fail to explain the detailed agreement between the universal traditions. Something much more profound must have inspired the image. Today, several independent researchers connect both the enclosing serpent and the primordial "sun" to the axis mundi, a column said to have once risen from the earth to the sky. This suggests that the cross-cultural theme of the glowing serpent and orb might have been inspired by intense plasma discharge in the heavens, perhaps comparable to the aurora, but much more powerful. We know from plasma experiments that such effects would likely include the cosmic “thunderbolt” described in early traditions.